With this software, you no need to apply online online programming or change SA. Now you can use Vediamo to do any offline programming, design code, change the SA Code and other functions. 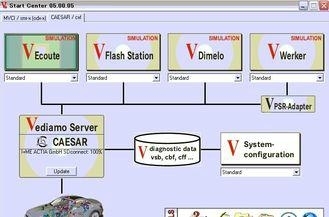 Mercedes-Benz factory super engineering version is used by engineers to develop diagnostic software used in engineering software, which is now Xentry and DAS we used is based on the Mercedes-Benz Super ENGINEERING developed and delivered out to the general use of aftermarket dealers. Therefore, the use of super-Benz engineering version is open in all diagnostic diagnostics / Coding Coding / modification / programming function on and there is no limit. Do not have to be able to freely increase through VEDOC (original application with code modification process) or reduce SA code, to modify the vehicle is equipped with a purpose, such as: increased SA500 electric folding mirrors. Xentry and DAS development model commonly known as: Data Engineering to develop after 2010 edition version adds a number of functional limitations. So we can not use the experience to do anything special modified version is too new vehicles can not enter the control unit, or enter the control unit. For example: W204/212, 2012 years of regional language to modify the instrument configuration, or open other resources convenience features.